From the time I first saw Disney's Living Desert, I've wanted to do some of the same cool time lapse photography for flowers opening and other slow events like I saw in the movie. Fast forward (for far longer than I'd like to admit) and, for the first time, I had a camera with time lapse capability! My iPhone 3G and a neat little app, TimeLapse, let me control the timing of my shots without being present and pushing the button. COOL! But, I then found out there wasn't any way to attach my iPhone to my camera tripod! How can I take time lapse photos of anything, let alone a 9-hour series of a night blooming Sirrus cactus, without attaching to a tripod/stand or something? Bummer! I'd realized sometime earlier that, of the 25,000 photos in iPhoto of the grandkids (mostly taken with my iPhone), I was in only a handful and those were taken by 4-year olds. Not much of a legacy. Now, I'm the kind of guy who walks through a store looking at things, not as they are are or are intended, but for what they could otherwise be used for. So, I found a temporary solution, worked but looked like cr*p. I even designed a really cool holder and spent thousands of dollars getting a prototype before I learned it would take a hefty five-figures to just produce the molds for it. Everyone said I was nuts, that no one wanted to take pictures or movies with their low quality iPhone camera. Dadgumit, I did and I figured out of the other zillion or so other iPhone owners, someone would. I came up with a workable solution, easy to use and affordable to produce in the USA. It's a simple L-shaped piece of acrylic, a couple of strips of Velcro® and a threaded screw hole. I added a laser engraved logo and web address for a little pizzazz. 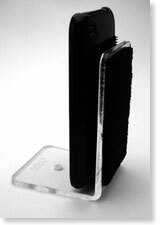 (1) black, iPhone (3G/s or 4) snap-in case. Velcro is already attached so just snap your iPhone in and you're ready to use d'Trod right out of the box! (1) 2"x4" Velcro strip (hook) for mounting another device to d'Trod. I keep one d'Trod in my car for driving directions and shooting as a dash cam, and one screwed to my tripod's plate so I'm ready to shoot wherever I am. Using Duplicam, I can set my iPhone on the tripod outside for taking bird/squirrel pictures and snap pictures remotely using my iPad inside or far removed. It's worked perfectly for me about 100' away, outdoors, line of sight. Great for monitoring kids or pets in another room. While the case is designed for an iPhone, if you want to use something else, just get some Velcro strips at the store and you can use anything with d'Trod. That's the beauty of d'Trod, it is a system which allows you to attach anything to a tripod mount. Anyway, bottom line is, d'Trod is really handy if you like taking photos and videos with your iPhone or other smart phone and would like to get a lot more out of it. 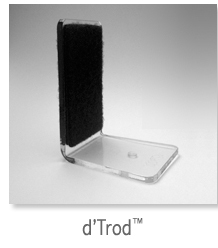 Only d'Trod works perfectly with all Apple iPhone models and other phones and media devices. d'Trod - New possibilities! New fun! 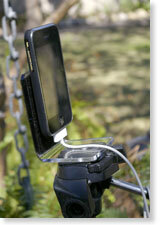 Ever wish you could attach your iPhone to a real, full-height, camera tripod? Set it up on a desk or shelf for videoing or live broadcasting? Have a dashcam? Be part of your family photos and home movies? Take steady, shake-free videos with your new iPhone 4? Amateur or pro, if you're exploring the growing world of iPhone imagery and like taking photos and videos with your iPhone or other phone cam, d'Trod is the accessory you've been longing for...particularly if you have a new iPhone 4! d'Trod makes a great makeshift mount even when a tripod isn't handy; just attach your phone or camera normally and set d'Trod on any flat surface. That's all there is to it! Sometimes, simple is better. d'Trod is one of those times. With d'Trod, TimeLapse, Duplicam, and other great iPhone and iPad photo and video apps, you can bring wildlife up close, finally, put yourself in your family's pictures and movies, and do so much more than you ever could before! Works with any camera tripod including Joby's cool Gorillapod! Works without a tripod! Set it on any flat surface! Take perfectly aligned HDR photos with your iPhone 4's native camera app; on 3G/S models, use one of the great HDR apps! Take long series TimeLapse photos! Perfect for sunsets, blooming flowers, wildlife up close! Perfectly aligned panoramas with Pano! Connect your iPhone with your iPad for remote shots! I've found Duplicam works great over both my WiFi and Bluetooth. Not only is it fast, its streaming preview offers a great way to keep tabs on another location-child's room, garage, garden or any place within range! Set it on your dash for GPS driving. 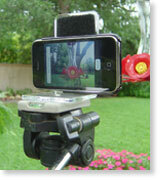 Turn your iPhone into a live broadcast dashcam! Set it on your desktop or a shelf and take unattended photos and videos! 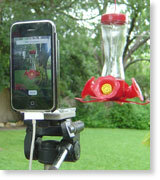 Use d'Trod with an inexpensive table top tripod (a buck at the Dollar Store) for iPhone 4's FaceTime and video blogs! 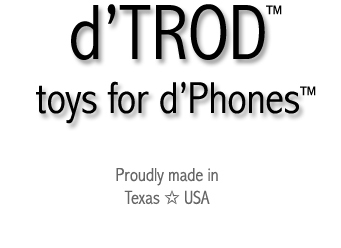 Designed for d'Phones, d'Trod works great with any phone, any device! Compare the included iPhone case with those sold at most stores for $19-$29! You get one plus d'Trod and the Velcro strips for less than they charge for just the case itself! Simple & beautiful, d'Trod's made from the same high quality, crystal acrylic as the elegant d'Stand. Corporate logos and promotional messages can be expertly laser engraved for unique promotional giveaways! 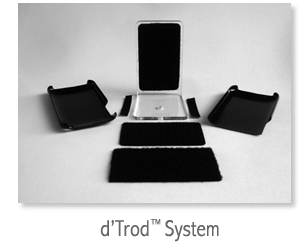 The cases included as part of d'Trod system are designed for the iPhone 3G/GS and the new iPhone 4. Please indicate which iPhone you'll be using to receive the correct case. If you are using another device, please check "Other."